We've been working hard at checking boxes on our Kids Summer Bucket List. 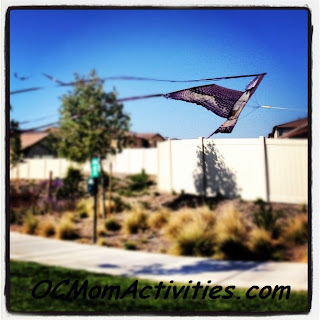 This last week we tackled flying a kite! Great idea! This would be on our list. Nice! The bucket list is such a great idea. I think I need to make one so we get to the beach and the science center a couple of times this summer. We are hitting two huge ones on my bucket list. First a dude ranch and then Peru! Want to see your company on here? Advertise on OCMomActivities.com. We have a number of options, email OCMomActivities (at) gmail (dot) com to find out more! Katie is a wife and mother of two active boys. When they aren’t riding the roller coasters at Disneyland or exploring the beaches, you can find Katie writing over at OCMomActivities. Find her on Twitter or become a fan on Facebook. Having lost her mother (and best friend) to Cancer before her 20th birthday, Katie shares her unique passion hoping to truly inspire other mothers to enjoy and make the most out of every moment with their children. Respect goes both ways people. The frog that came back! Summer Grilling Made Easy and Delicious! What influences what's on your table? S'mores Cheesecake - June Dairy Month Fun! Do you know of a fun adventure in Orange County, a neat park, cool product or fun activity to do with kids? If you do, send me an email, I'd love to feature it on the blog! *Please note that all photos used on this website unless directly linked to another are my personal photographs and may not be used without my persmission.